Every box contains 2 Piecworks cards! There are 12 different Pieceworks cards including items worn by Phoebe, Piper, Paige, Billie, and Chris, as well as a Dual Swatch card with material from a top and pants worn by Piper during Season 8. 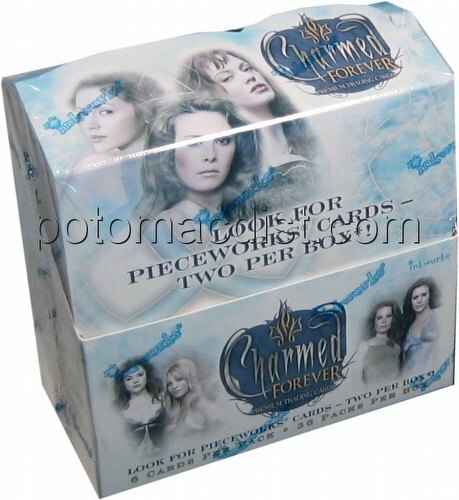 Other inserts include a 9-card "Legacy" puzzle set featuring Charmed Ones and their family members, a 6-card foil/etched "Forever Family" set featuring behind-the-scenes shots from the last Charmed tapings, a 3-card "And They Lived Happily Ever After" set , as well as Inkplates cards. There is also a special "The Power of Four" case topper card inserted in every case. Customers pre-ordering 20 boxes (2 cases) will receive a special triple-costume Pieceworks card featuring all 3 Charmed Ones from the Season 5 episode "Oh My Goddess!" A new premium trading card set from Inkworks featuring the sisters of Charmed. Includes Pieceworks� Cards and Inkplates™ Cards! Long before the sisters ever became the Charmed Ones, the Triad designed a plot to destroy the powerful witches. But in the end, nothing and no one would be able to conquer the determination of Piper, Phoebe and Paige to insure that the Halliwell family would remain…Charmed Forever. This 72-card set recaptures the final season storyline, character cards, the ultimate battle, and more! “And They Lived Happily Ever After” - Three foil cards (3 cards - inserted approximately 1:35 packs).